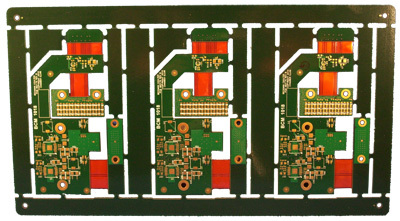 Combination of flexible and rigid substrates laminated into single package forming a 3D interconnect that can be bent and folded into higher-performing PCB--allowing designers to replace multiple PCBs interconnected with connectors, wires and ribbon cables with a single package offering improved performance and reliability. Rigid-flex can be found in applications ranging from consumer electronics to high-end aircraft mounted weapon guidance systems. Overall, military aerospace and medical devices are the most common applications for rigid-flex as they are often the best way to reduce weight, and sometimes the only way to make a device feasible for the end application (e.g., pacemakers, smart jackets). Encapsulating the features of the rigid board with the FPCB culminate in a product that is as durable as it is malleable. For instance, floating rigid caps used in wearable technology (intelligent clothing) applications not only meet SMT reliability standards but also provide the necessary flexibility that is amenable to the natural contour of the clothing.